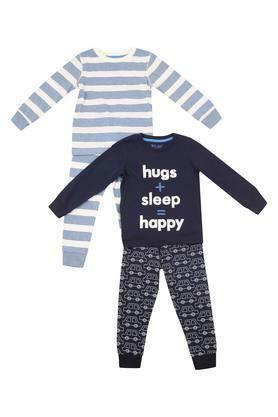 Make sure your little munchkin sleeps soundly throughout the night by dressing him in this pack of two pants and tee set brought to you by Mothercare. You may rest assured your little one will remain at ease, as they are crafted from good quality fabric that has a soft texture. Besides, one set of them comes with a graphic print tee and the pair of printed pants, while the other one comes with a striped pattern which will make your baby child look all the more cute and endearing. The cute and trendy design of this pack of two pants and tee set is sure to make them your kids favourite.